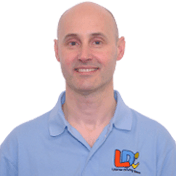 Learning to drive with Jules Baines and the LDC system has been a fantastic experience and I passed my driving test with only one minor fault. The guidance the workbook and my instructor offered has enabled me to become a confident and safe driver. I feel I have gained the skills I need for a lifetime of safe driving. The workbook allowed me to understand what was going to happen in each lesson and this removed some of the worry and concern I had when first getting into the drivers seat! The lessons were highly structured and informative, giving me the opportunity to learn how to 'drive' and not just how to pass the test. 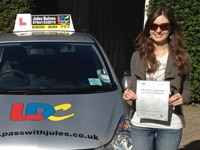 I would highly recommend Jules Baines and the LDC system.